Air China promotion: Fly to Mongolia from Zurich €409, Paris €439 or Germany €523.. Exploring Petra, famous archeological site in Jordan, located three hours drive from Amman, this winter season is possible thanks to promotional sale of TAROM, Romanian flag carrier. (And member of SkyTeam alliance). Return flights from various cities in Europe to Amman are now available already for €88! Look for flights departing from Bucharest, Vienna, Brussels, Amsterdam, Barcelona, Madrid, Budapest, Paris, Sofia, Athens, Frankfurt, Munich, Belgrade or London. All charges and fees and 23kg bag are included in base fare. If interested in this TAROM offer from Europe to Jordan you will find limited travel options between 16th of January to 21st of March 2018. Based on latest date of your inbound flight from Middle East to Europe. Hurry up as very limited availability and seats on each of the travel dates. You can book your accommodation in Jordan through Hotels.com or Booking.com. Inbound Wednesday, Friday or Sunday. 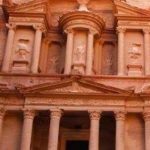 Booking sample of Cheap return flights from Europe to Amman, Jordan from €88! Also as you would follow our above link to the deal you depart from Bucharest to Amman on 17th of January. Your return flight from this ancient country to Austria would be then on Friday, 26th of January 2018. Do not miss this opportunity to visit Jordan, one of the safest Arab countries in the Middle East.